BACKGROUND AND PURPOSE: The appearance of the damaged spinal cord after injury correlates with initial neurologic deficit, as determined by the American Spinal Injury Association grade and manual muscle test score, as well as with recovery, as assessed by manual muscle test scores. The purpose of this study was to determine whether the presence of spinal cord hemorrhage and the size and location of spinal cord edema on MR images is predictive of functional recovery in survivors of cervical spinal cord injury (SCI). METHODS: The degree of damage to the cervical spinal cord was measured on the MR images of 49 patients who underwent imaging within 72 hours of sustaining SCI. The effects of hemorrhage and length/location of edema on changes in the value of the motor scale of the functional independence measure (FIM) were assessed on admission to and discharge from rehabilitation. 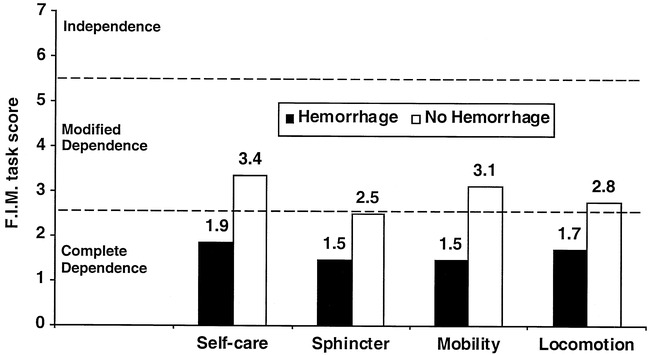 RESULTS: Patients without spinal cord hemorrhage had significant improvement in self-care and mobility scores compared with patients with hemorrhage. There was no significant effect of spinal cord hemorrhage on changes in locomotion and sphincter control scores. The rostral limit of edema positively correlated with admission and discharge self-care scores and with admission mobility and locomotion scores. Edema length had a negative correlation with all FIM scales at admission and discharge. CONCLUSION: The imaging characteristics of cervical SCI (hemorrhage and edema) are related to levels of physical recovery as determined by the FIM scale. Imaging factors that correlate with poor functional recovery are hemorrhage, long segments of edema, and high cervical locations. Previous clinical studies of prognosis in cases of spinal cord injury (SCI) have primarily focused on the use of initial neurologic parameters to predict neurologic outcome. Lazar et al (1) showed that initial motor index scores were useful for predicting functional outcomes for quadriplegic patients and self-care skills for paraplegic patients, but they were not useful for predicting mobility skills for paraplegic patients. Crozier et al (2) showed that motor-complete SCI patients with preservation of pin sensation below the level of injury initially had a better prognosis for ambulation than did motor-complete SCI patients with preservation of light touch sensation alone. Assessment of the motor power of individual muscle groups, however, is distinctly different from assessment of functional recovery in the disabled person. Functional assessment scales focus primarily on a patient's ability to perform those tasks that are necessary for independent daily living (eg, bathing, eating, ambulation). The functional measure offers an estimate of the societal burden of the person's disability in terms of cost and dependence on others and on technologic devices (3). 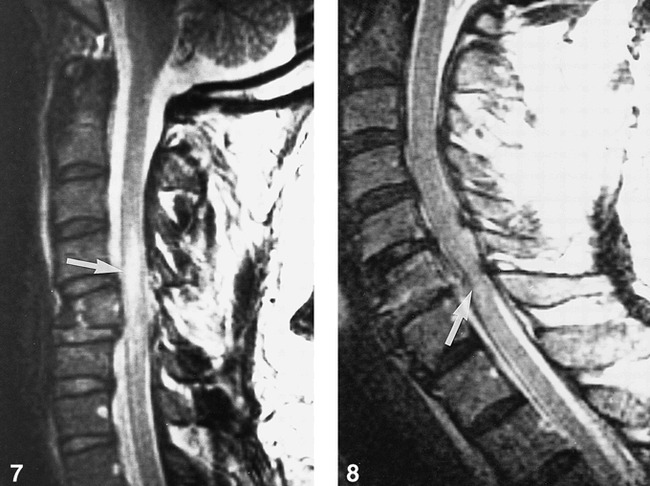 Several prognostic studies have shown a relationship between the degree of spinal cord damage, as depicted by MR imaging, and neurologic outcome (4–11). We recently showed an improvement in the prediction of motor recovery in cases of acute traumatic tetraplegia when the results of a single initial MR study of the spinal cord were combined with the results of the initial clinical examination (12). The presence of spinal cord hemorrhage, the length of spinal cord edema, and the location of the upper interface between damaged and undamaged spinal cord showed independent predictive value in the recovery of motor power in the upper and lower extremities. Although several investigators have shown a relationship between MR findings and motor recovery, no previous imaging study has examined the relationship between MR findings in the injured spinal cord and functional outcome of patients with SCI. The purpose of this study was to examine the relationship between the MR parameters of SCI (spinal cord hemorrhage and edema) and the recovery of functional motor skills as measured by the functional independence measure (FIM). During a 5-year period, 328 patients with cervical SCI were admitted to the Regional Spinal Cord Injury Center of the Delaware Valley within 72 hours of injury. Each patient was assessed clinically using the American Spinal Injury Association (ASIA) standards for assessment of neurologic injury (3). The inclusion criteria were isolated cervical SCI from nonpenetrating trauma at neurologic levels C3 to T1, a single diagnostic-quality MR imaging study of the cervical spine obtained within 72 hours of the initial injury, and two complete FIM evaluations obtained at admission and discharge from the acute rehabilitation program. One hundred ninety-seven patients underwent emergent MR imaging of the cervical spine and spinal cord after closed reduction. Seventy-nine of the 197 MR studies were lost or incomplete, so only 118 studies were available for analysis. Four of the 118 studies were judged to be unacceptable for interpretation because of imaging artifacts, motion, and noise; therefore, 114 cervical MR studies were available for inclusion in the study. Forty-nine of the 114 patients had complete admission and discharge FIM data available for use in this analysis. The final study group consisted of 49 subjects (41 men and eight women) with a mean age of 38 years and an age range of 17 to 70 years. Fourteen patients (29%) had complete motor and sensory impairment (ASIA grade A) at the time of injury, 13 (27%) had complete motor impairment but preserved sensory function (ASIA grade B), 19 (39%) had preserved motor function below the level of injury of the majority of key muscles below the neurologic level with a muscle grade of less than 3 (ASIA grade C), and three (6%) had preserved motor function below the level of injury of the majority of key muscles below the neurologic level with a muscle grade greater than or equal to 3 (ASIA grade D) (3). The neurologic level of injury is the most caudal segment of the spinal cord with normal sensory and motor function on both sides of the body (3). Four percent of the patients were graded at the C3 neurologic level, 48% at C4, 27% at C5, 19% at C6, and 2% at C7. All patients underwent MR imaging of the cervical spine and spinal cord within 3 days of initial injury after closed reduction of the fracture, subluxation, or both, and before undergoing surgical stabilization. MR imaging was conducted on a 1.5-T superconducting unit. At the time of admission to the Regional Spinal Cord Injury Center, each patient was fitted with an MR imaging-compatible graphite halo or, when appropriate, a fiberglass cervical collar. Imaging included four series in the sagittal plane. T1- and T2-weighted spin-echo sagittal sequences were obtained using a 22-cm field of view, a 4-mm section thickness with a 1-mm gap, and a 192 × 256 matrix. The parameters for the T1-weighted images were 600/20/2 (TR/TE/excitations); for the T2-weighted images, 2000/30,80/1; and for the fast spin-echo acquisition images, 2000–3000/20,80–102/2–4 with a 256 × 256 matrix and an echo train length (ETL) of 8. An additional sagittal sequence was performed using gradient-echo methods (eg, 50/15 with a flip angle of 15°). Gradient-moment nulling was used for the T2-weighted and gradient-echo sequences. The field of view incorporated the lower brain stem, the entire cervical spinal cord, and the upper thoracic region to T3. All MR examinations were assigned a quality rating of satisfactory or incomplete. The minimum required pulse sequences for this study included sagittal T1-weighted spin-echo, sagittal T2-weighted spin-echo (or sagittal T2-weighted fast spin-echo), and sagittal gradient-echo acquisitions. Incomplete studies did not satisfy the minimum requirements. An MR study that met the minimum requirements was designated as satisfactory. Four MR studies were judged to be unacceptable and were excluded from analysis. Quantification of damage to the spinal cord was based on measurements made on midsagittal MR images. The quantification method was based on the premise that the clinical significance of a lesion in the spinal cord depends on its morphology, length, and location. 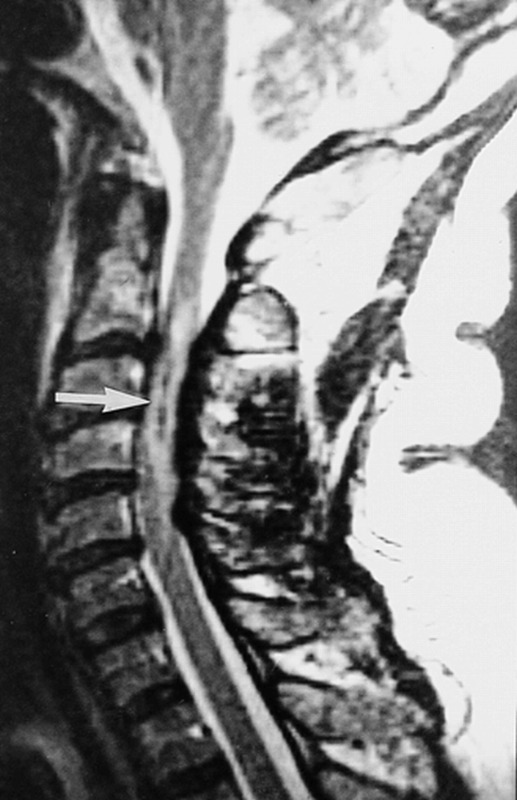 A damaged segment of the spinal cord may exhibit three characteristics on MR images: cord swelling, as indicated by alterations in spinal cord caliber; cord edema, as indicated by intramedullary hyperintensity on T2-weighted images; and acute cord hemorrhage (deoxyhemoglobin), as indicated by focal decreased signal on T2-weighted or gradient-echo images (4–12). The use of quantitative parameters to describe the spinal cord allows for a more detailed statistical analysis of the relationship of the MR findings to the outcome parameters. The location of the damage to the spinal cord was quantified by locating the longitudinal boundary of the spinal cord hemorrhage and edema relative to the nearest adjacent spinal vertebral landmark, as described by Flanders et al (12) (Fig 1). Each vertebral body was divided into two parts, the upper half and the lower half, which were segments 1 and 2, respectively, and the intervertebral disk below each vertebral body was segment 3. An anatomic location was labeled as the portion of the closest vertebral body that intersected a horizontal line drawn through the lesion. 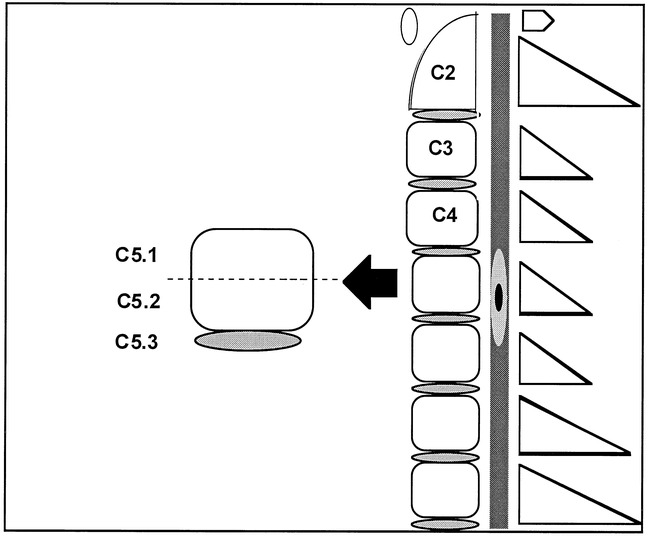 For example, a lesion located at the level of the lower half of the fifth cervical body was expressed as C5.2, and the C5 to C6 intervertebral disk was described as C5.3. Each segment location from C2 to T1 was rank ordered, yielding 22 possible locations. Using this method, the location of upper (rostral) and lower (caudal) limits of edema were recorded to determine length of edema. The number of segments between the upper and lower limits represented the edema length. All available imaging series were reviewed collectively by a single neuroradiologist who was blinded to the clinical status of each patient. The sagittal gradient-echo and T2-weighted images were used to determine the extent of hemorrhage. The T2-weighted sagittal images were used to determine the extent of edema. The extent of hemorrhage was supplemented by the gradient-echo sagittal images. The presence of hemorrhage was used as an independent variable in the analyses of motor recovery. Because edema was present in all cases, length of edema was selected as an independent variable in the analyses. The most rostral point of edema was selected as a measure of the location of the SCI on MR images because the degree of loss of function after SCI depends in part on how high the lesion is on the cervical spinal cord (3). The impact of the injury on the patient's level of disability when performing real-world tasks, such as bathing, walking, and feeding oneself, was measured by using the FIM, an 18-item scale of degree of independence in performing physical and cognitive tasks, including self-care, sphincter control, mobility, locomotion, communication, and social cognition (Table 1). The conceptual basis of the FIM scale is to determine the burden of care required to assist persons in completing these physical and cognitive tasks (13). Psychometric assessment of the FIM has revealed that it consists of two distinct scales: a motor scale, comprising the first 13 items, and a cognitive scale, including the final five items (14). Because the cognitive scale has little relevance in cases of SCI because of ceiling effects, only the motor scale was used in this study (15). Each task was given a score ranging from 1 (total assistance required) to 7 (complete independence). The patients were graded on their performance of FIM tasks by the treating therapists and nurses at admission to and just before discharge from rehabilitation. The scores for the motor subscales were used as dependent variables (self-care, sphincter control, mobility, and locomotion), for a total potential motor scale score of 91. Self-care scores are the sum of six items and range from 6 to 42; mobility scores are the sum of three items and range from 3 to 21; sphincter control scores are the sum of two items and range from 2 to 14; locomotion scores are the sum of two items and range from 2 to 14. Pearson correlation coefficients were calculated to examine the relationships between edema (length and rostral limit) and FIM scores. Analyses of variance (ANOVAs) with repeated measures on the admission and discharge FIM scores were obtained to examine the effect of hemorrhage on functional abilities. The length, rostral, or both limits of edema were entered as covariates in the ANOVA for each dependent variable that was significantly correlated with a measure of edema. A P value less than .05 was used to determine significance. Statistical analyses were conducted using STATISTICA (StatSoft, 1994). We compared the information on 49 patients who had complete FIM data with the information on 55 patients who did not have complete FIM data using t-tests for independent groups and χ2 analyses. The two groups did not differ with regard to age, length of edema, proportion with hemorrhage, or level of neurologic injury. For both groups combined, the mean age was 36 ± 15.4 years, the mean length of edema was 8.9 ± 4.5 vertebral segments; 57% had hemorrhage, and the median level of neurologic injury was C4. The group without complete FIM data, however, contained a greater proportion of patients with complete motor and sensory impairment (ie, ASIA impairment grade A) compared with the group of 49 patients who were subjects in this study (52.7% versus 28.6%; χ2 = 7.99; P = .046). MR images showed abnormal findings in all 49 subjects. All studies revealed evidence of spinal cord edema, and 28 studies (57%) showed evidence of parenchymal hemorrhage. The length of time between injury and admission to rehabilitation ranged from 3 to 81 days (median, 16 days). The length of stay in acute rehabilitation ranged from 9 to 272 days (median, 21 days). Descriptive statistics of the admission and discharge FIM scores and total scores are presented in Table 2. ANOVAs with repeated measures on admission and discharge FIM scores for patients with and without hemorrhage were obtained with length of edema and rostral limit of edema included as covariates. The results of these analyses are shown in Table 3. Significant interactions were found between the presence of hemorrhage and the repeated measures of self-care and mobility scores. Self-care scores improved significantly from admission to discharge for both groups; however, the improvement was much more dramatic for the patients without spinal cord hemorrhage (F distribution = 10.01; degrees of freedom (df), 1.45; P < .01) (Fig 2). 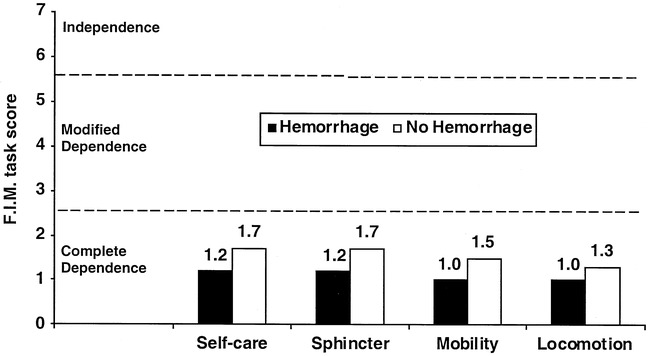 Post hoc comparisons showed no difference in initial self-care scores for patients with and without hemorrhage (7.07 versus 10.33, respectively), but a significant difference was found between groups at the time of discharge (11.11 versus 20.10, respectively; P < .0001). A significant interaction was also found between hemorrhage and mobility scores; patients with hemorrhage did not improve as much as did patients without hemorrhage (F distribution = 7.74; df, 1.45; P < .01) (Fig 3). Post hoc comparisons showed that patients with and without hemorrhage had similar admission mobility scores. 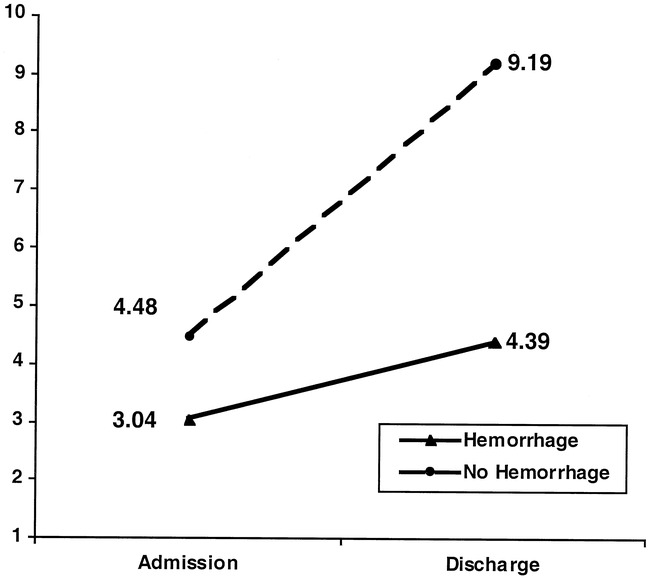 Patients with hemorrhage, however, did not show significant gains in mobility at the time of discharge (Fig 4), whereas patients without hemorrhage did improve significantly between admission and discharge (P < .0001). For both locomotion and sphincter control scores, we found significant improvement between admission and discharge, but there was no significant effect of hemorrhage. Patients had a mean score of 2.29 at admission and a mean score of 4.43 at discharge on the locomotion scale (Table 2). On the sphincter control scale, patients had a mean functional level of 2.8 at admission and a mean functional level of 4.0 at discharge (Table 2). The average task score in each subscale category at admission to (Fig 5) and discharge from (Fig 6) rehabilitation improved for patients both with and without spinal cord hemorrhage. Nonetheless, the individual task scores obtained at the time of discharge for patients with hemorrhage remained low, corresponding to a functional level that required maximal assistance from a helper or a device to perform the task. The group of patients without hemorrhage improved to a greater degree than did the group with hemorrhage (modified dependence level) in regard to self-care, mobility, and locomotion tasks, indicating that the patient was able to provide a minimum of 50% of the effort required to complete the task. ANOVAs were also performed for the motor scale score, which was the sum of the individual above-described scores. The results were similar to those reported for the self-care scale, which is not surprising, because self-care items comprised nearly half the items on the motor scale. 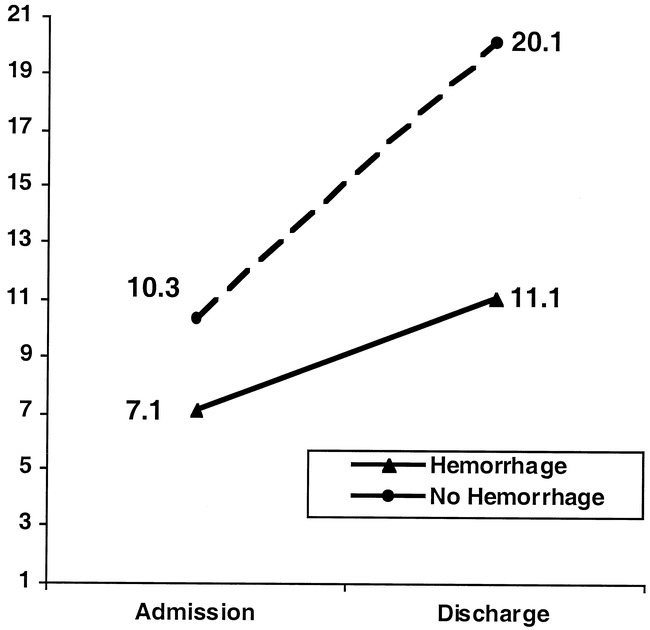 A significant interaction was found between the presence of hemorrhage and the scores obtained at admission and discharge (F = 9.08; df, 1.45; P = .004). Table 4 shows the correlations between the MR measures of edema and the FIM scores obtained at admission and at discharge. The rostral limit of edema showed moderate correlations with admission (+.52) and discharge (+.48) self-care scores and somewhat weaker correlations with admission mobility and locomotion scores (+.30 and +.36, respectively). The rostral limit of edema was positively correlated with the motor scale scores obtained at admission and at discharge (+.44 and +.35, respectively). Because of the manner in which the rostral location of edema was recorded, these results indicate that function was better when the location of injury was lower on the spine (Figs 7 and 8). Edema length showed a pattern of negative correlation with FIM scores, indicating that function was worse when the edematous injury was longer. Sphincter control was not correlated with any of the MR measures of edema. When used as a covariate in the ANOVA with spinal cord hemorrhage, edema length was not independently related to the self-care or mobility scores, after taking into account the presence of hemorrhage and the location of edema (Table 3). As a covariate, location of edema was significantly related to discharge self-care scores. Neither edema length nor rostral limit of edema was significantly associated with the total motor scale score. The results of this study reaffirm the work of previous investigators who showed that the MR findings of SCI have a direct association with the physical parameters that determine prognosis; our imaging study shows an association between MR findings and functional outcomes. The presence of spinal cord hemorrhage and lesion location has a dramatic impact on functional outcomes, as assessed by the FIM. A similar relationship between the MR findings of spinal cord hemorrhage, lesion length, and lesion location on the recovery of motor power in the upper and lower extremities has been illustrated in a previous study (12). The additional evidence of an association between MR findings and functional outcomes as assessed by the FIM validates the use of MR imaging as a prognostic tool in gauging the potential for recovery in cases of SCI. The ability to perform a task (eg, bathing, dressing, feeding) involves the complex integration of motor power of various muscle groups, sensory stimuli, motor reflexes, coordination, and psychological motivation. Therefore, measures of task performance offer a more comprehensive assessment of a person's capacity to perform useful motor skills than do individual motor scores. The FIM provides a standard assessment of disability that can be used by health professionals to gauge a person's ability to perform daily tasks. The conceptual basis of the FIM is burden of care; that is, it seeks to measure how much assistance is required if a person is not independent. The system of scoring specific FIM tests contains information regarding the degree of independence, the extent to which independence is achieved through adaptive equipment, and the amount of help needed when independence is not possible (see Table 1). FIM scores have been correlated with minutes per day of direct care required (16). There are distinct differences between the definition of physical impairment (as measured by motor power or the manual muscle test) and disability (as measured by the FIM). The World Health Organization has provided a framework of disablement that describes the pathologic conditions leading to an impairment that may result in a disability (17). Pathologic conditions refer to the changes in the structure or functioning of a specific tissue or organ. Impairment is a loss or an abnormality of physiologic function. Disability is a restriction or lack of ability to perform an activity in the manner considered normal (17). In this study, the pathologic condition was the abnormality of the spinal cord as depicted on MR images, the impairment was the weakness evidenced by the motor index score of the extremities, and the disability was the deficit in self-care and mobility as documented by the FIM. As one crosses domains from pathologic condition to disability, the strength of association among measures wanes, because other factors, such as comorbidities, age, motivation, and availability of support, come into play (18). Therefore, one should not expect MR findings, a measure of pathologic conditions, to be as strongly associated with disability as are motor scores, a measure of impairment. Motor scores can explain up to 68% of the variance in FIM scores in cases of SCI (19). The MR characteristics approximate the neurologic level (proximal extent of edema) and ASIA grade (hemorrhage versus edema) (6, 12), which are gross measures of impairment. It is no surprise, then, that the correlations between MR findings and FIM scores, although statistically significant, are smaller than the correlations reported between FIM and motor scores or motor scores and MR findings. The positive findings in this study support the MR findings as a measure of pathologic condition in cases of SCI. The potential limitations of this study include the small patient cohort and the inherent inability to control for the variable length of stay in rehabilitation. A prolonged rehabilitation period could potentially bias the results in favor of an improved recovery. The results show, however, that there was a broad range of length of stay for all patients. Moreover, the subset of patients with spinal cord hemorrhage (with the associated severe initial neurologic deficit) had a mean rehabilitation period that was less than that of the subset of patients without spinal cord hemorrhage. The wide range in length of stay means that some patients may not have reached a plateau in function by the time of discharge. This is particularly true of patients in halo orthoses or other immobilization devices that restrict movement. Collection of FIM data at a fixed time after injury would result in more uniform outcome data and may improve the predictive power of MR findings. Although a large number of patients with SCI were evaluated at our center during the study period, they were not included in this analysis because of the absence of complete FIM data or because no MR study was conducted at the time of injury. In addition, we were unable to control for the potential effects of surgical stabilization and medical therapies on FIM scores. All patients in this study underwent imaging after closed reduction of subluxation/dislocation and before surgical stabilization. At our institution, surgery is generally delayed beyond the acute injury period. All patients received high-dose intravenous methylprednisolone during the first 24 hours after injury, as per ASIA recommendations (20). The lack of significance between the MR parameters and the sphincter control and locomotion subscale scores for all patients is most likely related to the minimal change in these scores between admission to and discharge from rehabilitation. The level of significance was found primarily with the subscales that showed a greater change in mean value, such as the self-care, mobility, and total motor scores. There are limitations of the FIM as a measure of disability. It was designed as a minimum data set, not a comprehensive set of tasks (13). For example, it lacks items concerned with instrumental activities of daily living, such as shopping, cooking, and house cleaning, that are necessary for a person to function in the community. The burden of care focus of the FIM sometimes obscures a patient's capabilities and may account for the lack of association between MR characteristics and certain FIM subscales. For example, locomotion on the FIM can be accomplished by walking, pushing a manual wheelchair, or operating a power wheelchair. Adaptive equipment is effective in reducing the potential disability in locomotion. Thus, by the time of discharge from rehabilitation, locomotion has little relationship to the amount of damage to the spinal cord or to weakness in the extremities. Evaluation of sphincter function with the FIM is not an actual measure of sphincter power, because it relies on upper extremity function by assessing a patient's ability to independently insert a urinary catheter or rectal suppository. The FIM is impractical or unreliable for high cervical injuries (eg, C2 to C4) because it cannot distinguish between patients with minimally preserved motor strength and those with complete paralysis. Moreover, the FIM does not measure the speed in which a task is performed or the motivation of the patient or caregiver. A patient may be incapable of performing a particular task because of other factors, such as depression. Despite these limitations, however, the FIM is a good measure of disability and is able to distinguish different levels and severity of SCI (15). Patients showed significant improvement in FIM scores between admission to and discharge from rehabilitation; this effect was modified by the presence of hemorrhage for self-care and mobility scores. After controlling for the effect of hemorrhage, the rostral limit of edema was significantly correlated with discharge self-care scores. The relationship between hemorrhage and improvement in FIM scores suggests that the results of an initial MR study can be used to determine a person's potential for rehabilitation. Identification of frank hemorrhage within an injured segment of spinal cord parenchyma is a potent predictor of poor functional outcome. Moreover, the higher a lesion extends in the spinal cord, the poorer the functional outcome is likely to be (Figs 4, 7, and 8). In conjunction with the results of an initial MR study, subsets of patients could be selected for more aggressive rehabilitation programs and novel medical/surgical therapies on the basis of a number of initial clinical evaluations. Because most patients with SCI undergo at least one MR examination at the time of injury, this prognostic information is often routinely available at no additional cost to the patient. The appearance of the spinal cord parenchyma during the immediate period after SCI is reflective of a patient's capacity to perform complex motor tasks that are necessary for independent living. High-cervical hemorrhagic lesions revealed by MR imaging are predictive of complete dependence on caregivers and equipment for living outside the hospital environment. Low-cervical, nonhemorrhagic (edema only) lesions portend a modified dependence, requiring partial aid from caregivers and equipment for existence outside the hospital environment. We give special thanks to John F. Ditunno, Michelle Cohen, Geraldine K. Zelazny, and Mary D. Call of the Regional Spinal Cord Injury Center of the Delaware Valley for support and helpful suggestions. 1 Supported by the RSNA Research and Education Fund, Scholars Program. 2 Address reprint requests to Adam E. Flanders, MD, Department of Radiology, Division of Neuroradiology, Thomas Jefferson University Hospital, Suite 1072, Main Building, 132 S. Tenth St, Philadelphia, PA 19107.